It’s like they say: never anger a riverbeast. Like heavily-armoured environmentalists on all fours, these rock-like hippoposters appear docile until their habitat is disturbed. After that, they appear as 4,000 pounds of fat and muscle charging headlong towards your avatar. 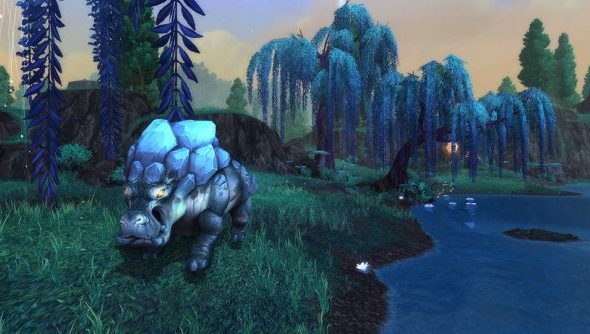 Level 90 or no, Shadowmoon Valley promises “countless hidden perils” for Warlords of Draenor first-timers once they’ve trudged through the Tanaan Jungle. The riverbeasts set a precedent for the fauna in this south-eastern Draenor zone, where the moon shines more brightly than the sun during the day. Most of the indigenous species found here are prepared to live and let live unless stumbled across under the wrong circumstances. The Elekk are mammoth-like grazing animals whose fearsome tusks serve primarily as a deterrent – they won’t become aggressive until their herd is threatened or watering hole compromised. Unfortunately, that’s exactly what Thunderlorn Clan orcs are wont to do – capturing and turning elekk to their own, warlike ends. The Podlings are both fauna and flora – diminutive and disarmingly absurd-looking sentient bushes which only attack when the numbers are in their favour. They come in poison, ensnaring and physical attack variants, and pull their victims down into the weeds to fertilise their young. Cute, though. The Draenor Ancients are, simply put, ents. And in their case, wanderers have no excuse not to guess what’ll get their barks up. Chopping at the valley’s trees will see these creatures emerge to protect their homeland, hundreds of years in the making. In short: the elements of Draenor’s population that aren’t already up for war are allergic to adventuring. At least we’ll have prettier corpses in WoW’s new expansion. Have you seen Warlords of Draenors’ new Draenei model?